Diamine Shimmertastic ink, in a nutshell: almost more trouble than it’s worth. In spite of owning every last one, I haven’t reviewed any of the J. Herbin 1670 inks yet. I’ve been too busy enjoying them – that company knows how to both build and live up to the hype. By the time Emerald of Chivor became available last year, I NEEDED that ink to live. I ordered a second bottle from a different distributor because the first one I’d ordered didn’t seem to be coming fast enough (even though it arrived the next day). 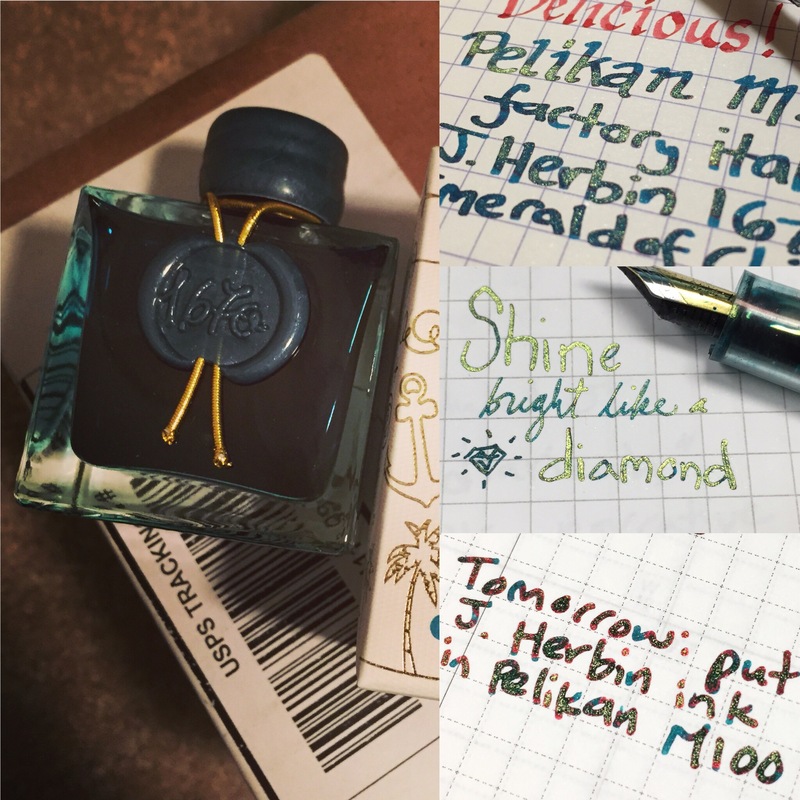 Emerald of Chivor is life. I HAVE NO REGRETS. 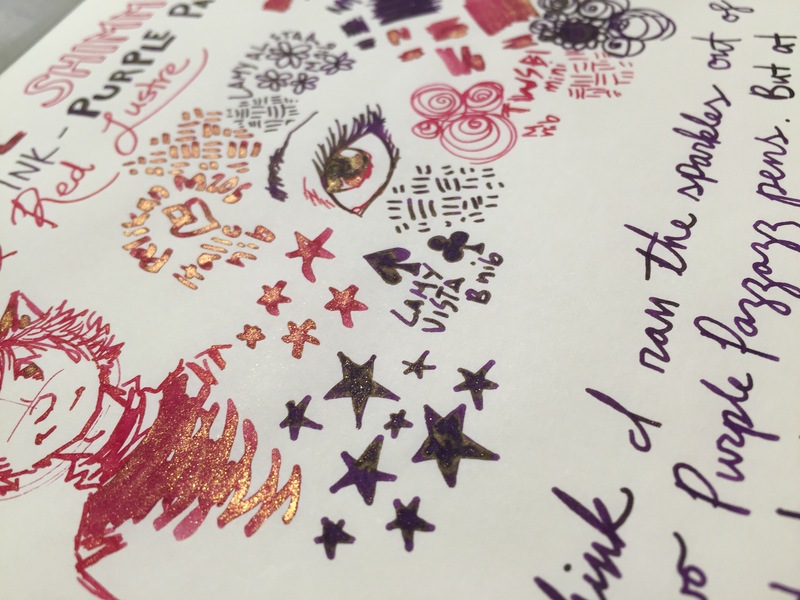 But I was not among those excited by the announcement that Diamine would be dropping a whole line of TEN shimmer-filled inks. I was psychologically spent after the satisfying fulfillment of Chivormania; I didn’t have the emotional resources to care about TEN DIFFERENT INKS that I definitely could not afford all at once. I put the whole line out of my mind, until someone at pen club (possibly Tom with all the Pelikans) brought in a bottle of Purple Pazzazz and a bottle of Red Lustre, giving away samples to try. 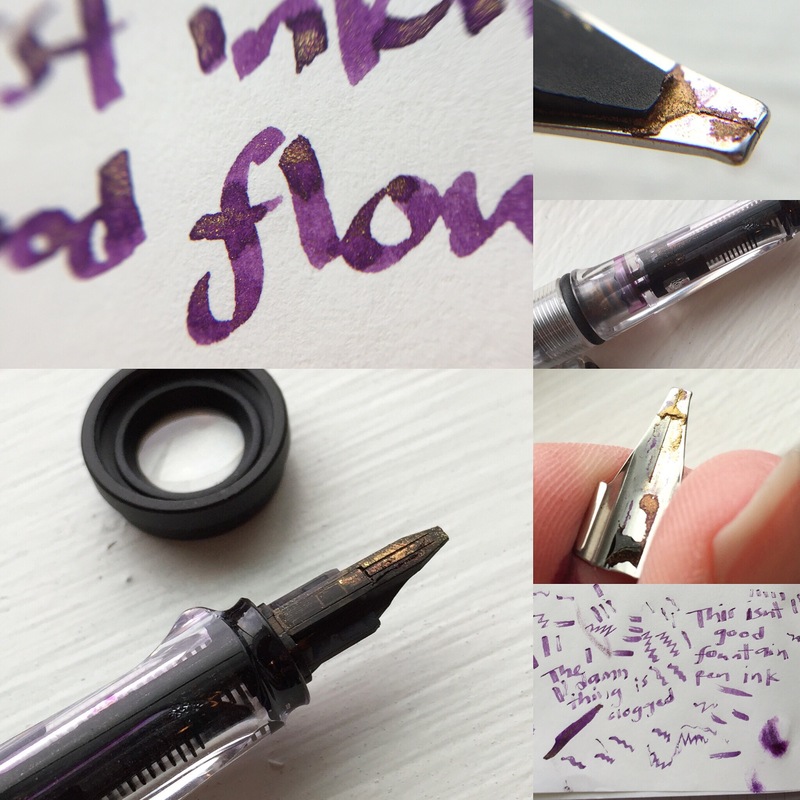 I started with Purple Pazzazz in a Lamy Vista with 1.9mm calligraphy nib, chiefly because every last J. Herbin 1670 ink has done fantastically with the Lamy feed/1.9mm nib combination. After about one sentence, the flow choked up. This Diamine stuff was definitely a different beast. I swapped on a broad nib instead, and the pen was coaxed into cooperation. Purple Pazzazz in a Lamy Al-Star with medium nib gave me no trouble. Time then to try the Red Lustre. TWSBI mini with 1.5 stub? NOPE. Nothing but failure. A. G. Spalding Bros mini pen, the juicy one? Couldn’t even get the ink to flow to the end of the nib. Monteverde Artista Crystal? The clear feed shows exactly where the ink stops, and goes no more. In desperation (and seriously lacking in the broad nibs department of my life for some reason), I inked up my Pelikan M205 with the gigantically juicy factory italic nib – at last! Success! Delicious success! You can see the shimmer particles settle and move in the juicy lines of ink. Just as I was about to consign this color to dip pens only, here at last a glimmer, shimmer of hope. I swapped the biggest non-stub TWSBI nib I had (a medium) onto the mini, and after some nib-flossing it works now, more or less reliably. More tests will determine if this cooperation is color based, or if I just didn’t have the right pen/nib combos for the red as I did for the purple. 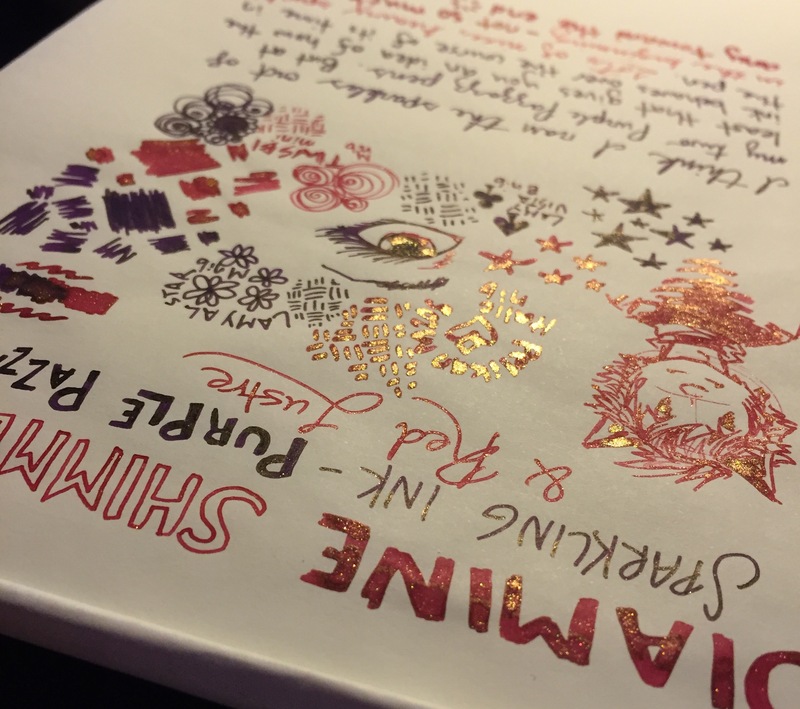 I’ve got the Goulet Pens Shimmertastic Sample set now, so in due time I can properly assess the entire line. On to the ink itself, once on the page – a delightful sparkle. Like writing with some form of arcane magic. Moreso than the J. Herbin 1670 inks though, the sparkles will spread all over the page, far beyond where the ink is located. Your writing takes on the appearance of a fairy sneeze when tilted to the light. 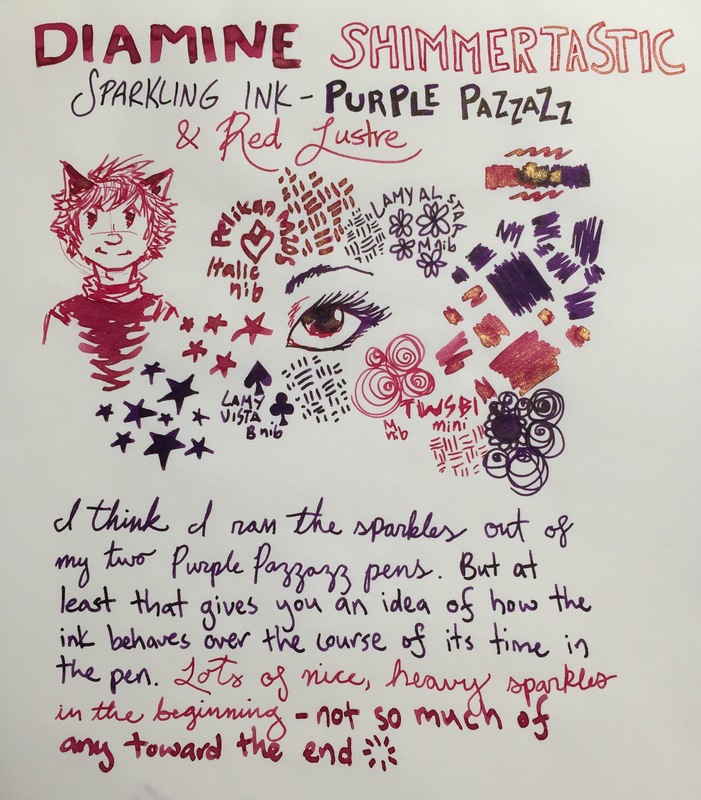 I don’t know why the sparkle spreads – the particles definitely settle a little faster in the solution than the J. Herbin particles do in theirs, so perhaps that in some way has something to do with it. I haven’t used the pen in the ink bottle technique to fill anything with these inks — I think the sparkles settle too quickly for that. Shake your sample/bottle vigorously, and use a syringe to draw ink from about the halfway down or so point, and you should end up with a decent amount of sparkle and bling. And although I am irresponsible and have left these inks sitting in my pens for quite a little bit of time with no negative consequences, you should probably clean out any pens you put this ink into on a regular basis. In spite of all the attendant frustration, the lovely look of these inks makes it worth my while. 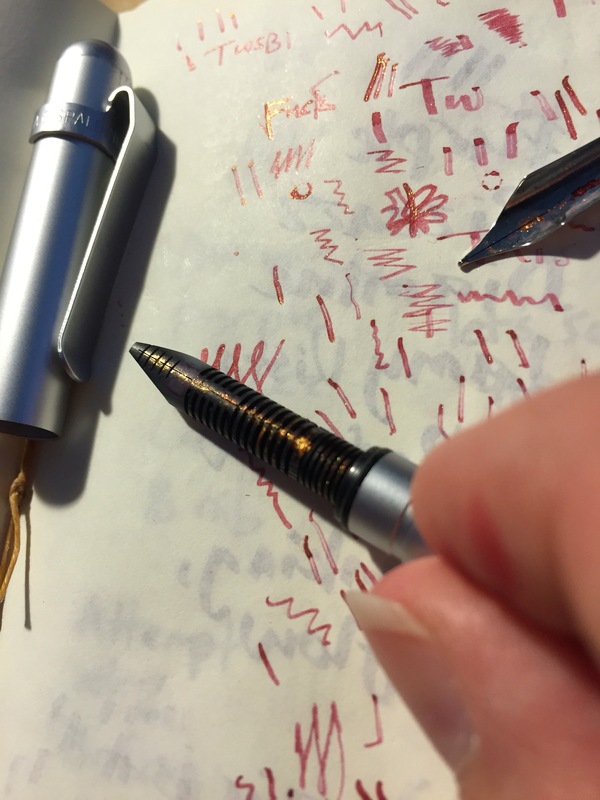 Avoid the headache and stick to dip pens with this ink, or brave the sometimes unsuccessful combinations in the quest for a perfect pen/nib/ink shimmertastic trifecta.